Here’s one of those funny, the singular form is is also the plural, words I particularly enjoy. Perhaps coincidentally, moose are generally solitary animals. 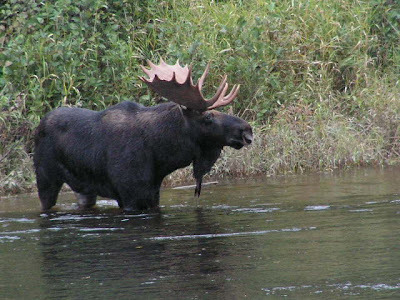 Moose are the least social species among cervids, remaining fairly solitary except during the mating season. The quote above from the answers page “are groups of moose called herds“, to which the answer is yes, but only during mating season – one male herds a group of females. No image of a Moose herd could be found in the 15 minutes I spent looking. Sorry. This entry was posted on Thursday, May 5th, 2011 at 11:00 pm	and is filed under Language. You can follow any comments to this entry through the RSS 2.0 feed. You can leave a comment, or trackback from your own site. Tiny baby bunny Whim. Just try not to awe so loud. on Flickr.Tiny baby bunny Whim. Just try not to awe so loud. © 2019. Fun To Think About. Powered by A Slothenly Meow.